Tile tattoos are a brilliant response to the expensive job of re-tiling your shower, bathtub enclosure, or kitchen backsplash. There are times during a plumbing repair where replacement matching tile arent available. Thats where tile tattoos come in! The one thing that stays constant in this home improvement/remodeling industry is innovation. Hipper, better, easier, shinier; its the thing that makes money for architects, interior designers, and building contractors. Tile tattoos are a brilliant idea. The name itself is bound to generate sales simply because of the term tattoo. Tats, once shunned in social circles (excluding drunk sailors on shore leave), have entered the mainstream in the last decade or so. As a matter of fact, a recent Pew Research Center survey reports that 36% of individuals aged 18 to 25, and an eye-opening 40% of individuals aged 26 to 40, have been inked at least once. No wonder that the makers and distributors have elected to dub their product what they did. And theyre a quick DIY job that exhibits a major design change. So, what exactly is a Tile Tattoo? Its really just a graphic sticker, designed to be applied in either non or high-humidity rooms in the home, to decorate or simply re-color ceramic tiles in your bathroom or kitchen backsplash. Obviously, theyre not exactly prime candidates for floors finished with ceramic tile. They can be purchased in both solid colors (say, to make an alternate white/black pattern), or a theme or design pattern that accentuates the existing tiles. For instance, if, after a plumbing repair job, an exact match cant be found, simply buy some as similar as possible. Are Tile Tatoos Difficult to Install? Clean all the ceramic tile surfaces completely. TSP works well; wear gloves. Determine your design and install the tats. If your remodeling design involves complete color changes, take time to align the corners precisely. 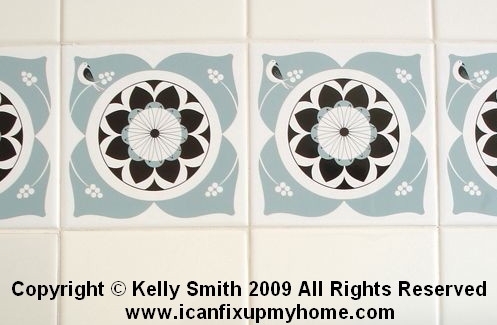 If youre making patterns, you might strike a chalk line across the tiles instead of measuring from your grout lines. They're rarely perfectly even and a crooked pattern will show up where a solid colored wall will not. Can They be Relocated After Installation? Absolutely! As long as youre using high quality tile tattoos, relocating them is not an issue. Theyll stick to your tile statically, just like some car windshield stickers do. Just peel them off, then install them at the new location. Dont forget to clean the new location. Applying a few tile tattoos is a quick and simple approach to spiffing up and giving your kitchen backsplash or bathroom walls a quick touch of class without the effort of financing a complete remodel in these hard economic times.